Stunning. Incredible. Gorgeous. Beautiful. Amazing. 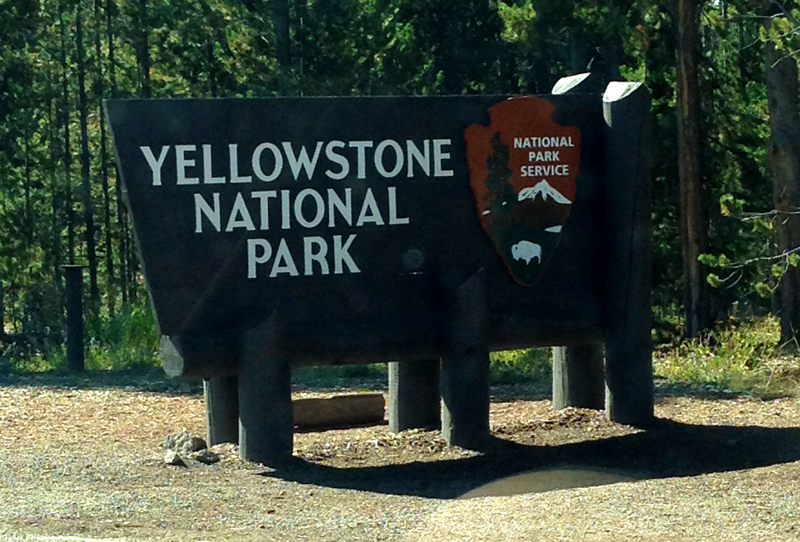 By 3pm, we were already out of adjectives to describe our wonder and awe at Yellowstone National Park. The name “Yellowstone” is perhaps a bit misleading, because most of the rocks aren’t yellow, but we were surprised to see so much diversity in color. The colors are as bright and beautiful as they are varied, and my camera couldn’t accurately capture the stunning hues. I was also impressed by the different textures in the park. From water to wood to lava, everything has a different shape and consistency. The trees definitely aren’t your standard pines. And animals big and small seem to appear out of nowhere. Yellowstone is obviously famous for its various landmarks, too. We spent most of our time in the Lower Geyser Basin admiring the Fountain Paint Pots, hot springs, mud pools, and frequently-erupting geysers. 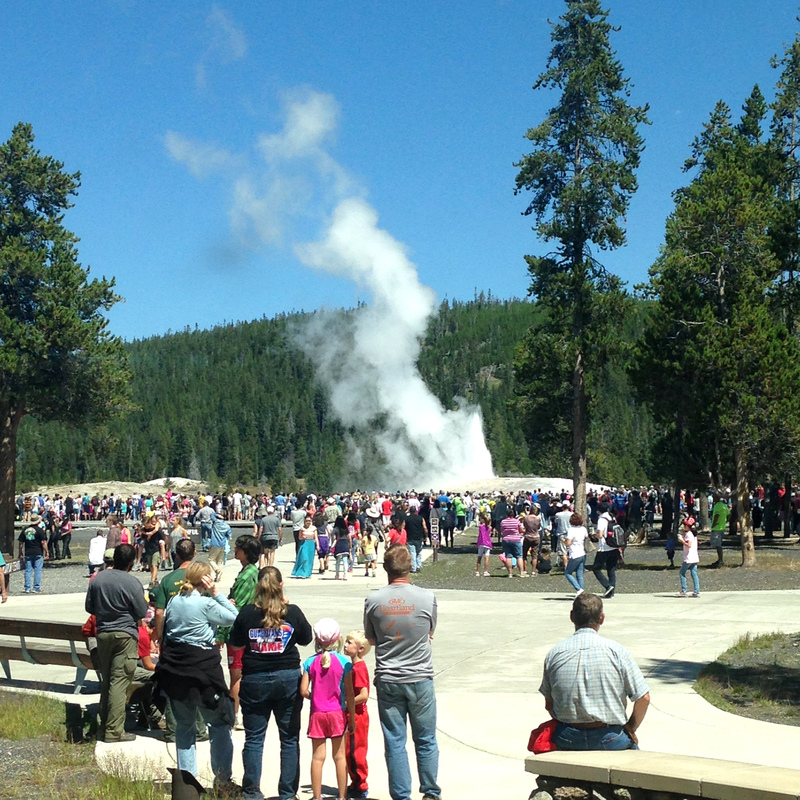 We couldn’t get a parking spot at Old Faithful, but we did get to see it erupt from the lot and I snapped one picture from inside the Visitor Center. Lone Star is another well-known geyser, but it requires hiking or biking about 4 miles round trip to see it. By the time Matt and I reached the geyser on foot, we’d just missed the eruption by half an hour. On our way out of the park we also stopped at West Thumb on Yellowstone Lake, which was a nice way to fit in a couple more small geysers/hot springs and look out over the water. Unfortunately, we didn’t have a ton of time to explore the national park (a day is nowhere near long enough for the full Yellowstone experience because the park is enormous), but we enjoyed the scenic drive just as much as our opportunities to get out and explore. Then again, I’m not sure that even a week would’ve been enough time. Or a year. With a national park that’s so magnificent and biodiverse, you have to be satisfied with loving your time there and planning to return. Sabina, it’s so very hard to really capture the beauty of Yellowstone, but you’ve done so wonderfully! I visited a year ago and it’s majesty was breathtaking. Thanks for sharing and for bringing back memories of my trip there! Thank you for your kind words, Stacy!! It truly is difficult to capture all the nuances of its beauty. These photos are just incredible!! Yellowstone must be a fantastic experience. Thank you!! I’d be fascinated to read Yellowstone steampunk–seems like an interesting genre! If you can ever make it to the park, I highly recommend it. Some really great shots. Yellowstone is definitely on my bucket list. You’re right though, no matter how much time I get to spend in these magical places, it never seems to be enough. Wow, that looks amazing. It’s now top of my bucket list and has been since I wrote a profile of the park for one of my clients (I think I put the link on your last post). It’s truly incredible. I’m really glad we got to go, even for a day. I need to go to Yellowstone one day! You took awesome pictures! Thank you! We did cover a lot of ground and we were exhausted by the end of the day. You make me wish that I’d better lived in USA. Then this blog would have been my guide.